Sensory information, like touch or smell, is relayed from the body to the brain by the nerves. When something is wrong with the nerves, such as inflammation or damage, they send pain signals. 2 similar but distinct conditions affecting the legs can arise from nerve inflammation: sciatica and peripheral neuropathy. Both of these conditions are characterized by pain, numbness, tingling, and weakness in the legs. While the symptoms of these 2 nerve-related leg pain conditions are similar, there are some differences. Leg pain from sciatica is directly related to the sciatic nerve, which branches from the lower back down the hips, buttocks, and thighs. When a condition such as sacroiliac joint dysfunction or degenerative disc disease causes the sciatic nerve to become inflamed, it can lead to sciatica. Sciatica pain is felt in the back of the leg, and usually only 1 side of the body is affected. Sciatica pain may also be experienced in the lower back and buttocks. Unlike the leg pain from other conditions, sciatica pain may actually worsen with rest. If left untreated, sciatica can make standing or walking difficult. In some cases, it can even make everyday activities like going to work impossible. While peripheral neuropathy’s symptoms can be similar to sciatica, leg pain from peripheral neuropathy is not experienced solely on the back of the legs. Instead, pain often begins in the feet and slowly spreads upward into the legs. Numbness or weakness might also be experienced. Additionally, leg pain from peripheral neuropathy can be accompanied by frequent muscle cramps that can make movement difficult. Peripheral neuropathy is usually the result of an injury that damages nerves, such as blunt trauma or a broken bone. A sedentary lifestyle can also damage nerves and lead to peripheral neuropathy. Additionally, the complications associated with diabetes can sometimes cause peripheral neuropathy. If this is the case, the pain is referred to as diabetic peripheral neuropathy. Among the simplest forms of treatment for both sciatica and peripheral neuropathy is exercise. For sciatica, physical activity conditions the muscles of the lower back, lessening stress on the nerves there. Exercise also helps keep bones in healthy condition, which reduces the risk of degeneration that could ultimately lead to sciatic nerve irritation and inflammation. For those suffering from peripheral neuropathy, exercise can help maintain a healthy weight and prevent muscle cramping. If the leg pain from these conditions is severe, though, exercise may not be a viable option. Oral medications can sometimes provide relief, but the most common over-the-counter pain medications, non-steroidal anti-inflammatory drugs (NSAIDs), are sometimes not effective at reducing nerve-related pain. Opioids can often provide relief, but because of a high risk of dependency, physicians don’t usually recommend oral opioids for extended use. Injected medications can provide low-risk, longer-term pain relief from nerve-related leg pain. When someone suffering from nerve-related leg pain wants a non-invasive pain treatment, his or her physician might suggest injected medications. These injections typically include an anesthetic to block pain signals along the nerves. A steroid might also be included to reduce the inflammation causing painful symptoms. Injections of medications are distinguished by which condition they treat and, by extension, which area of the body they’re injected into. During a pain-reduction injection procedure, the physician will first clean and sterilize the area to be injected. A local anesthetic is often administered to numb the skin. During a sciatic nerve block, the physician then injects a pain medication, such as lidocaine, directly into the sciatic nerve bundle. 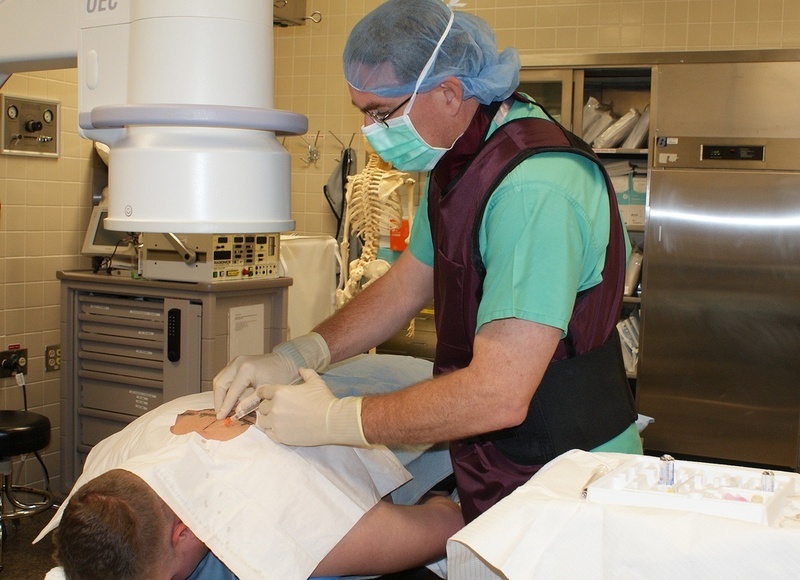 Patients generally report immediate pain relief after receiving a sciatic nerve block. Another potential treatment for sciatica pain is a sacroiliac nerve block injection. The sacroiliac joint connects the spine to the hips, and dysfunction of this joint can cause sciatica. A sacroiliac joint injection is the delivery of medication directly into the sacroiliac joint or into the tissue surrounding the joint. Surprisingly, some studies have shown that a sacroiliac joint injection is more effective if administered to the tissue surrounding the joint, rather than the joint itself. A sacroiliac joint injection typically includes a steroid to reduce nerve inflammation. Before the procedure, the physician will determine which area of the sacroiliac joint is suffering the most inflammation. This way, it can be assured that the steroid reaches the area where it can do the most good. An epidural steroid injection can also be beneficial for nerve-related leg pain, particularly for peripheral neuropathy. During an epidural steroid injection, the medication is injected into the region surrounding the spinal cord, which is called the epidural space. Nerve roots are located in the epidural space, and by targeting the inflamed nerve roots, an epidural steroid injection can reduce inflammation and reduce pain. If successful, these injections can provide relief from leg pain for anywhere from a week to a year. This pain relief can allow people who suffer from nerve-related leg pain to resume their daily lives. In addition to this, pain relief from injected medications can also allow people to begin an exercise regimen that will reduce the severity of future pain. Do you suffer from leg pain that might be reduced by injected medications?